Now here’s a gem that’s escaped my notice for far too long. 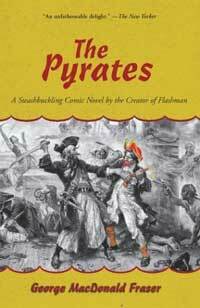 First published in 1983, The Pyrates is certainly as fresh and witty today as it was back then. Taking place in a non-specific part of the Golden Age of Piracy, the tale ranges from England to Madagascar to the Caribbean, and features the wildest cast imaginable. The characters are highly (and intentionally) stereotyped, and this is put to great comedic use. The hero, Captain Ben Avery, is brave, dashing, and impeccable in every fashion. The author makes frequent mention of his manicured nails and chisled jawline. Indeed, Avery seems perfect in every fashion, so it should naturally follow that every woman in the book swoons after him, be they admiral’s daughter, pirate queen, Spanish maiden, or missionary nun turned tribal goddess and chocolate addict. Whatever their role in this book, each of these women share one thing in common (aside from their lust for Captain Avery, that is) – each is heart-wrenchingly gorgeous, and each knows how to play that to maximum effect. They pout when they need to pout, scream appropriately when a damsel-in-distress scenario is called for, and slump to the ground to lie in a vulnerable-yet-alluring position when knocked out cold by the bad guys. As to the bad guys – who might they be? Well, that’s debatable. The author clearly shares our soft spot for pirates, and as such they’re only marginally treated as “bad guys.” Like Avery and his women, they are heavily stereotyped, although a bit more diversely as they range from the sturdy Captain Rackham to the dashing Black Bilbo, and even to the hulking Firebeard, complete with fuses in his bristling chin-hair. Each draws clear inspiration from both history and cinema pirates, and each is hilarious and wonderful in their own right. At just over 400 pages, this book should keep you busy for a while. It’s irreverant and hilarious, poking shameless fun at every pirate and nautical cliché imaginable, but doing so with great affection all the while. The more immersed you are in pirate history and pop-culture, the more you’ll enjoy its wit and references. In fact, I’m fighting off the urge to rent every Errol Flynn pirate movie I can find, and then to read this again just to see what I missed the first time around. Great, great fun. This entry was posted in Books and tagged bilgemunky's favorites, fiction, fraser, humor by Bilgemunky. Bookmark the permalink. This book I love. Love to pieces (you should see what my copy looks like). I’d love to see it made into a movie (since it’s practically a movie already). Not mentioned in the review is the presence of Col. Thomas Blood (cashiered, bought out, and all too obviously our anti-her0)…the very same Tom Blood that tried to make off with the Crown Jewels. This book has the Capn Bob seal of approval…it’d even have the walrus of approval if I could get the ruddy beastie to stay still long enough. I too love this book, it’s funny, knowledgeable and warm hearted. I also have a copy done as a talking book, the reader is Nigel Lambert and he just brilliant Every voice is just as I imagined, belike, and his reading adds new layers of fun. As for filming the book, yes please, but it would be at least two parts. No trimimg the story please and Young Master Depp to be Colonel Blood. Do not read this book at night; you will wake people! I first found out about it through Art Bougeouise book The Mystery Companion (and and odd pick it was being the book was a directory for hard boiled and “cozy” English style mysteries). Being a Pirate fanatic I traveled afar to fetch it. Bougeouise wrote that the book “shows you the art of how to love something and make fun of it at the same time”. His little “romp through history” asides will keep you entertained and guessing; his way with names (Lady Malifula, my favorite) and his grasp of what is truly funny will leave you, well, laughing. Best comedic novel of the last century; maybe even this one too. As a writer, novelist and in the name of Lady Vanity, I can assure the world the great George MacDonald Fraser had more fun writing Pyrates than … going on a honeymoon. He takes the English language by the throat, commands it to become his personal rapier, then skillful wields that dazzling weapon to create a priceless piece of English literature. I care more about the book’s wonderful creativity, shameless disregard for convention, lack of self-consciousness and undaunted courage than for its pirate stories. Indeed, I believe George MacDonald Fraser rather became a pirate, boarded the HMS OXFORD and made off with its precious cargo of language, to use and enjoy – and enjoy he does – and so can we all, thanks to him.